For decades, bubble diagrams and program master plans have been the precursors to park and playground designs, segregating activities and age groups into defined areas. Inclusive design, multifunctional features and the added value of healthier communities are several trends that are pushing the design of public spaces in new directions. At the center of this revolution is play. A vehicle to engage the mind, activate the body and bring people together, play is at the forefront of reshaping parks to offer new experiences, while also creating community. Typical park designs, for many years, placed swings in one corner, a pop-up fountain in another and a picnic pavilion near the playground. These parceled program planning design techniques were the assumptions and building blocks of parks for generations. People visiting “bubble” parks tend to stay in one area when they visit and tend not to intermingle or explore further. This causes people to spend less time, get less exercise and meet fewer people. Too often, this led to predictability and devalued spaces. Communities were investing large amounts of resources into park components that were used by relatively small populations. Some current trends in play-centered park design are supportive in breaking the bubbles that traditionally divide functions and age groups. Breaking bubbles involves re-imagining the boundaries of each activity within the greater park setting, striving for integrated, interactive spaces that encourage exploration and providing new ways to engage with the park. Expanding the idea of a static playground into a dynamic play experience creates new opportunities for the use of the same space. A bridge becomes a musical instrument, an entry sign becomes a playful climbing element — an example of unconventional play that is discovered and that opens the experience to all ages. Multifunctional features allow for interpretation and exploration. These are key elements in non-prescribed play and in engaging multiple user groups. Verticality and elevation become new design tools to employ as experiences become three-dimensional. The unique and diverse array of possibilities attracts more ages and user groups. Each use beckons people to approach play in creative ways. This is not random design: spines and loops connect use areas, integrating play throughout the park. The separation of features encourages search and discovery as well as movement. This approach introduces visitors to the concept of choice and the use of imagination in play. Fluid play environments offer opportunities for families to play. All generations join in through the way activities are presented, and the offer of myriad approaches reinvents what we’ve known for generations as traditional playgrounds. The premise of custom play is based on non-prescribed activities and sharing. In some cases, older children can step in to coach younger ones on how to use equipment, enhancing social interaction between age groups. Design techniques that create interactive, multigenerational and multifunctional parks are woven together to present opportunities for all ages and abilities. Thinking about design as a three-dimensional volume drives innovation by offering 360-degree, nonlinear experiences and choices. This concept, when combined with play features, has been exceptionally useful in pushing the boundaries of fluid play environments with recent openings of notable destination playgrounds across the United States. History — of architecture, people or events — becomes the theme that drives the design of play-centered parks to be crafted for specific locations that cannot be replicated elsewhere. Custom play features often become the defining feature to represent the culture and context of a place. A musical theme, horticultural theme, industrial theme, nature theme: Custom play elements are contextually derived and informed through feedback from the community. Circulation itself can become a program element, where multiple paths lead to a given destination, allowing visitors to determine their own experience and difficulty level. Play elements can be woven along pathways versus confined to a specific “play area.” An elevated bridge can serve as vertical and horizontal circulation, while also providing shade, ADA accessibility and a place to admire distant views. Utilizing topography and site features to maximum extent can make a park belong exclusively to a location. Grade changes can be used to create a distinctive entry feature and capitalize on views to which people wouldn’t otherwise have access. Site preservation can lead designers to elevate features from ground level, providing unique access and circulation opportunities, while protecting environmental resources. Choice is key, and the idea of pushing landscape architecture to exaggerate natural site features prompts designers to focus in new ways. The concept of choice is not the only benefit or added value that results from breaking bubbles in park design. Healthy activity is supported and emphasized, with layouts that encourage movement and social interaction. The attention to mobility levels offers choices that can attract visitors who may not have access to equipment in other parks. Slides, stairs and ramps may be three approaches to tackle the same access point. “Green deserts” in the city fabric are addressed by locating parks in neighborhoods without access to recreation, bringing communities closer to the “10-minute walk” goal and providing social equity. The benefits of engaging, play-centric parks support multiple aspects of development. In general terms, independence and problem- solving are employed to inspire confidence, promote curiosity and support physical development. In more specific terms, health scores from local school districts can point to underserved neighborhoods and populations that would most benefit from new recreational choices. The movement benefits afforded by fluid play environments can address challenges with childhood obesity. Public engagement plays a defining role in shaping play-centered parks to serve neighboring populations. Needs may vary from one population to the next and shaping a park to serve diverse goals requires listening and responding to citizen input. Where a park in a more affluent area may focus on entertainment, sports fields and custom play, in a neighborhood of low-income residents, there may be an added need for equipment rental kiosks and community meeting spaces. From the design perspective, the concept of breaking bubbles plays out in different ways within any given park. 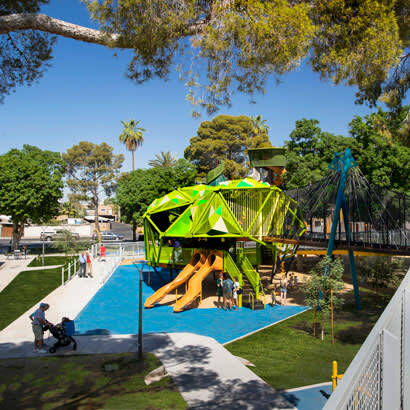 Landscape Architects at Dig Studio recently opened two destination parks designed to “break” bubbles: Pioneer Park in Mesa, Arizona, the city’s oldest park that required a major refresh, and Paco Sanchez Park in Denver, Colorado, that welcomed a national competition-level destination playground. The 17-acre Pioneer Park, which had lost its luster over time, stands out for its historic shade trees, remarkable in their size and maturity, which is a rarity in Arizona’s desert environment. Dig Studio capitalized on this feature by designing a play space in the tree canopy via an elevated walkway that became part of the play experience, while also protecting sensitive tree roots. Custom play structures replicate the form of the park’s historic trees, repurposing the park for the next generation of users within an imaginative play experience. The park’s historic layout, organized by a central spine, was preserved and repurposed with a new spray ground featuring an interactive light display that serves as a focal point from nearby Main Street. In Denver, the city’s Re-Imagine Play design competition ultimately led to the redesign of Paco Sanchez Park, which was named for a respected community activist who started Denver’s first Hispanic radio station. The park is in a west-side neighborhood and is easily accessible from a light rail line. The focus at Paco Sanchez Park is on intergenerational play, which is manifested through accessibility, challenge, inclusivity and play for all. The centerpiece of the park is a 30-foot custom “microphone” play tower that symbolically references the park’s namesake. A bridge from the highest point of the park provides an accessible route to the tower, while vertically accessing play features at regular intervals along the span. Ground breaking on Phase II of the park recently took place, and this will extend the park through a large play loop with custom elements that are representative of music and broadcasting. This layout responds to a 43-foot grade change and inspires movement from one play element to the next, supporting the health and wellness goals of the park. The innovative design techniques used on both parks repositioned them within their respective communities, becoming highly praised and immediately embraced by neighborhood residents. Walkways become play, play becomes art, art becomes shade — this is how the parks of tomorrow will be re-imagined. For park departments across the country, play-centric park designs are shaking up the concept of play, creating dynamic environments that replace traditional passive spaces and offer more inclusive and inventive places for all. Communities are benefiting from reinvestment, people are benefiting from access to healthy activities and multiple generations of people are engaging in play, leading to positive changes in communities that dare to break traditional bubbles to re-imagine play. Chad Atterbury, PLA, ASLA, is a Senior Associate Landscape Architect for Dig Studio. The author will do a deeper dive on “Breaking the Bubbles” on Thursday, September 27, during the 2018 NRPA Annual Conference in Indianapolis. For details about time and location, check out the full conference schedule.